Rebecca specialises in advising small to medium business clients engaged in activities across a variety of industries including professional services, building and construction, health, aged care, and service industries. This regularly involves assistance with the business owner's personal affairs as well as business operations. Rebecca emphasises the importance of forming solid relationships with her clients to deliver good taxation and business outcomes. She is an expert at assisting clients to grow and manage their business from initial set up through to maturity. Rebecca joined Pitcher Partners Brisbane in 2003 and became a senior manager in 2014. She joined Vincents in 2008 as part of a merger with Pitcher Partners Brisbane. Rebecca has over seventeen years experience, working in the taxation and business services areas of various Chartered Accounting firms. 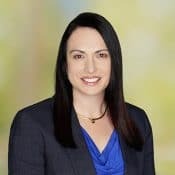 She began her working career as an articled clerk with a small law firm, and her experience in the legal field together with her accounting and taxation skills places her well to advise those in business.